A scar is an area of fibrous tissue that replaces normal skin after an injury. Scars result from the biological process of wound repair in the skin, as well as in other organs and tissues of the body. Thus, scarring is a natural part of the healing process. With the exception of very minor lesions, every wound (e.g., after accident, disease, or surgery) results in some degree of scarring. An exception to this are animals with complete regeneration, which regrow tissue without scar formation. Man with visible facial scars. All scarring is composed of the same collagen as the tissue it has replaced, but the composition of the scar tissue, compared to the normal tissue, is different. Scar tissue also lacks elasticity unlike normal tissue which distributes fiber elasticity. 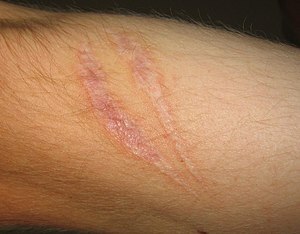 Scars differ in the amounts of collagen overexpressed. Labels have been applied to the differences in overexpression. Two of the most common types are hypertrophic and keloid scarring, both of which experience excessive stiff collagen bundled growth overextending the tissue, blocking off regeneration of tissues. Another form is atrophic scarring (sunken scarring), which also has an overexpression of collagen blocking regeneration. This scar type is sunken, because the collagen bundles do not overextend the tissue. Stretch marks (striae) are regarded as scars by some. Keloid scarring following persistent whipping. People with darker skin pigmentation are more prone to the development of keloid scarring. An atrophic scar takes the form of a sunken recess in the skin, which has a pitted appearance. These are caused when underlying structures supporting the skin, such as fat or muscle, are lost. This type of scarring is often associated with acne, chickenpox, other diseases (especially Staphylococcus infection), surgery, certain insect and spider bites, or accidents. It can also be caused by a genetic connective tissue disorder, such as Ehlers–Danlos syndrome. Humans and other placental mammals have an umbilical scar (commonly referred to as to a navel) which starts to heal when the umbilical cord is cut after birth. Egg-laying animals have an umbilical scar which, depending on the species, may remain visible for life or disappear within a few days after birth. A scar is the product of the body's repair mechanism after tissue injury. If a wound heals quickly within two weeks with new formation of skin, minimal collagen will be deposited and no scar will form. When the extracellular matrix senses elevated mechanical stress loading, tissue will scar, and scars can be limited by stress shielding wounds. Small full thickness wounds under 2mm reepithilize fast and heal scar free. Deep second-degree burns heal with scarring and hair loss. Sweat glands do not form in scar tissue, which impairs the regulation of body temperature. Elastic fibers are generally not detected in scar tissue younger than 3 months old. In scars rete pegs are lost; through a lack of rete pegs scars tend to shear easier than normal tissue. The fibroblast involved in scarring and contraction is the myofibroblast, which is a specialized contractile fibroblast. These cells express α-smooth muscle actin (α-SMA). The myofibroblasts are absent in the first trimester in the embryonic stage where damage heals scar free; in small incisional or excision wounds less than 2 mm that also heal without scarring; and in adult unwounded tissues where the fibroblast in itself is arrested; however, the myofibroblast is found in massive numbers in adult wound healing which heals with a scar. The myofibroblasts make up a high proportion of the fibroblasts proliferating in the postembryonic wound at the onset of healing. In the rat model, for instance, myofibroblasts can constitute up to 70% of the fibroblasts, and is responsible for fibrosis on tissue. Generally, the myofibroblasts disappear from the wound within 30 days, but can stay around in pathological cases in hypertrophy, such as keloids. Myofibroblasts have plasticity and in mice can be transformed into fat cells, instead of scar tissue, via the regeneration of hair follicles. Early and effective treatment of acne scarring can prevent severe acne and the scarring that often follows. As of 2014[update] no prescription drugs for the treatment or prevention of scars were available. Nonablative lasers, such as the 585 nm pulsed dye laser, 1064 nm and 1320 nm Nd:YAG, or the 1540 nm Er:Glass are used as laser therapy for hypertrophic scars and keloids. There is tentative evidence for burn scars that they improve the appearance. Ablative lasers such as the carbon dioxide laser (CO2) or Er:YAG offer the best results for atrophic and acne scars. Like dermabrasion, ablative lasers work by destroying the epidermis to a certain depth. Healing times for ablative therapy are much longer and the risk profile is greater compared to nonablative therapy; however, nonablative therapy offers only minor improvements in cosmetic appearance of atrophic and acne scars. Silicone scar treatments are commonly used in preventing scar formation and improving existing scar appearance. A meta-study by the Cochrane collaboration found weak evidence that silicone gel sheeting helps prevent scarring. However, the studies examining it were of poor quality and susceptible to bias. Topical steroids are ineffective. However, clobetasol propionate can be used as an alternative treatment for keloid scars. Research shows the use of vitamin E and onion extract (sold as Mederma) as treatments for scars is ineffective. Vitamin E causes contact dermatitis in up to 33% of users and in some cases it may worsen scar appearance and could cause minor skin irritations, but Vitamin C and some of its esters fade the dark pigment associated with some scars. First attested in English in the late 14th century, the word scar derives from a conflation of Old French escharre, from Late Latin eschara, which is the latinisation of the Greek ἐσχάρα (eskhara), meaning "hearth, fireplace", but in medicine "scab, eschar on a wound caused by burning or otherwise, and Middle English skar ("cut, crack, incision"), which is from Old Norse skarð ("notch, gap"). The conflation helped to form the English meaning. Compare Scarborough for evolution of skarð to scar. ^ a b Sherratt, Jonathan A. (2010). "Mathematical Modelling of Scar Tissue Formation". Department of Mathematics, Heriot-Watt University. Retrieved 20 August 2010. This is composed of the same main protein (collagen) as normal skin, but with differences in details of composition. Most crucially, the protein fibres in normal tissue have a random (basketweave) appearance, while those in scar tissue have pronounced alignment in a single direction. ^ a b c Gauglitz, Gerd; Korting, Hans (2011). "Hypertrophic Scarring and Keloids: Pathomechanisms and Current and Emerging Treatment Strategies". Molecular Medicine. 17 (1–2): 113–25. doi:10.2119/molmed.2009.00153. PMC 3022978. PMID 20927486. ^ Kelly, A. Paul (2009). "Update on the Management of Keloids". Seminars in Cutaneous Medicine and Surgery. 28 (2): 71–76. doi:10.1016/j.sder.2009.04.002. PMID 19608056. ^ Roseborough IE, Grevious MA, Lee RC (January 2004). "Prevention and treatment of excessive dermal scarring". J Natl Med Assoc. 96 (1): 108–16. PMC 2594768. PMID 14746360. ^ Martini, Frederic H. (2006). Fundamentals of Anatomy & Physiology, Seventh Edition, p. 171. Benjamin Cummings, San Francisco. ^ Goodman GJ (2000). "Postacne scarring: A review of its pathophysiology and treatment". Dermatologic Surgery. 26 (9): 857–871. doi:10.1046/j.1524-4725.2000.99232.x. PMID 10971560. ^ Fabbrocini G, Annunziata MC, D'Arco V, De Vita V, Lodi G, Mauriello MC, Pastore F, Monfrecola G (2010). "Acne Scars: Pathogenesis, Classification and Treatment". Dermatology Research and Practice. 2010: 1–13. doi:10.1155/2010/893080. PMC 2958495. PMID 20981308. ^ "Clinical manifestations and diagnosis of Ehlers-Danlos syndromes". www.uptodate.com. Retrieved 15 June 2017. ^ a b Brennan, Miriam; Young, Gavin; Devane, Declan (2012). "Topical preparations for preventing stretch marks in pregnancy". Cochrane Database of Systematic Reviews. 11: CD000066. doi:10.1002/14651858.CD000066.pub2. PMID 23152199. ^ Elsaie ML, Baumann LS, Elsaaiee LT (2009). "Striae Distensae (Stretch Marks) and Different Modalities of Therapy: An Update". Dermatologic Surgery. 35 (4): 563–573. doi:10.1111/j.1524-4725.2009.01094.x. PMID 19400881. ^ Hengge UR, Ruzicka T, Schwartz RA, Cork MJ (2006). "Adverse effects of topical glucocorticosteroids". Journal of the American Academy of Dermatology. 54 (1): 1–15. doi:10.1016/j.jaad.2005.01.010. PMID 16384751. ^ a b Wong, Victor W.; Akaishi, Satoshi; Longaker, Michael T.; Gurtner, Geoffrey C. (2011). "Pushing Back: Wound Mechanotransduction in Repair and Regeneration". Journal of Investigative Dermatology. 131 (11): 2186–2196. doi:10.1038/jid.2011.212. PMID 21776006. ^ a b c d Wilgus, T. A. (2007). "Regenerative healing in fetal skin: A review of the literature". Ostomy/wound Management. 53 (6): 16–31, quiz 32–3. PMID 17586870. ^ Tam, Joshua; Wang, Ying; Vuong, Linh N.; Fisher, Jeremy M.; Farinelli, William A.; Anderson, R. Rox (2016). "Reconstitution of full-thickness skin by microcolumn grafting". Journal of Tissue Engineering and Regenerative Medicine. 11 (10): 2796–2805. doi:10.1002/term.2174. PMC 5697650. PMID 27296503. ^ a b Ira D. Papel (2011). Facial Plastic and Reconstructive Surgery (Third ed.). USA: Thieme Medical Publishers. p. 7. ISBN 9781588905154. ^ "Endometrial repair". princehenrys.org. 18 September 2012. Archived from the original on 14 September 2009. Retrieved 30 June 2013. Importantly, the endometrium is the only adult tissue to undergo rapid cyclic repair without scarring. ^ a b c d e Wipff, Pierre-Jean; Rifkin, Daniel B.; Meister, Jean-Jacques; Hinz, Boris (2007). "Myofibroblast contraction activates latent TGF-β1 from the extracellular matrix". The Journal of Cell Biology. 179 (6): 1311–1323. doi:10.1083/jcb.200704042. PMC 2140013. PMID 18086923. Lay summary. ^ Plikus; et al. (5 January 2017). "Regeneration of fat cells from myofibroblasts during wound healing". Science. 355 (6326): 748–752. doi:10.1126/science.aai8792. PMC 5464786. PMID 28059714. ^ Horsley, Watt (6 April 2017). "Repeal and Replace: Adipocyte Regeneration in Wound Repair". Cell Stem Cell (Submitted manuscript). 20 (4): 424–426. doi:10.1016/j.stem.2017.03.015. PMID 28388424. ^ Ferguson MW, O'Kane S (May 2004). "Scar-free healing: from embryonic mechanisms to adult therapeutic intervention". Philos. Trans. R. Soc. Lond. B Biol. Sci. 359 (1445): 839–50. doi:10.1098/rstb.2004.1475. PMC 1693363. PMID 15293811. ^ Khunger N (January 2008). "Standard guidelines of care for acne surgery". Indian Journal of Dermatology, Venereology and Leprology. 74 Suppl: S28–36. PMID 18688101. ^ Khunger N (January 2008). "Standard guidelines of care for chemical peels". Indian Journal of Dermatology, Venereology and Leprology. 74 Suppl: S5–12. PMID 18688104. ^ Cooper JS, Lee BT (December 2009). "Treatment of facial scarring: lasers, filler, and nonoperative techniques". Facial Plastic Surgery. 25 (5): 311–5. doi:10.1055/s-0029-1243079. PMID 20024872. ^ Lemperle G, Rullan PP, Gauthier-Hazan N (September 2006). "Avoiding and treating dermal filler complications". Plastic and Reconstructive Surgery. 118 (3 Suppl): 92S–107S. doi:10.1097/01.prs.0000234672.69287.77. PMID 16936549. ^ a b Elsaie ML, Choudhary S (November 2010). "Lasers for scars: a review and evidence-based appraisal". Journal of Drugs in Dermatology. 9 (11): 1355–62. PMID 21061757. ^ Willows, BM; Ilyas, M; Sharma, A (4 August 2017). "Laser in the management of burn scars". Burns. 43 (7): 1379–1389. doi:10.1016/j.burns.2017.07.001. PMID 28784339. ^ Friedstat, JS; Hultman, CS (2014). "Hypertrophic burn scar management: what does the evidence show? A systematic review of randomized controlled trials". Annals of Plastic Surgery. 72 (6): S198–201. doi:10.1097/SAP.0000000000000103. PMID 24835874. ^ Khatri KA, Mahoney DL, McCartney MJ (April 2011). "Laser scar revision: A review". Journal of Cosmetic and Laser Therapy. 13 (2): 54–62. doi:10.3109/14764172.2011.564625. PMID 21401378. ^ Ogawa R, Yoshitatsu S, Yoshida K, Miyashita T (October 2009). "Is radiation therapy for keloids acceptable? The risk of radiation-induced carcinogenesis". Plastic and Reconstructive Surgery. 124 (4): 1196–201. doi:10.1097/PRS.0b013e3181b5a3ae. PMID 19935303. ^ Stavrou D, Weissman O, Winkler E, Yankelson L, Millet E, Mushin OP, Liran A, Haik J (October 2010). "Silicone-based scar therapy: a review of the literature". Aesthetic Plastic Surgery. 34 (5): 646–51. doi:10.1007/s00266-010-9496-8. PMID 20354695. ^ a b O'Brien, L; Jones, DJ (12 September 2013). "Silicone gel sheeting for preventing and treating hypertrophic and keloid scars". The Cochrane Database of Systematic Reviews. 9 (9): CD003826. doi:10.1002/14651858.CD003826.pub3. PMID 24030657. ^ a b c d Shih R, Waltzman J, Evans GR (March 2007). "Review of over-the-counter topical scar treatment products". Plastic and Reconstructive Surgery. 119 (3): 1091–5. doi:10.1097/01.prs.0000255814.75012.35. PMID 17312518. ^ Roques C, Téot L (2008). "The Use of Corticosteroids to Treat Keloids: A Review". The International Journal of Lower Extremity Wounds. 7 (3): 137–145. doi:10.1177/1534734608320786. PMID 18611924. ^ a b Jenkins M, Alexander JW, MacMillan BG, Waymack JP, Kopcha R. Failure of topical steroids and vitamin E to reduce postoperative scar formation following reconstructive surgery. J Burn Care Rehabil. 1986 Jul–Aug;7(4):309–312. ^ Nor, N. M.; Ismail, R.; Jamil, A.; Shah, S. A.; Imran, F. H. (25 November 2016). "A Randomized, Single-Blind Trial of Clobetasol Propionate 0.05% Cream Under Silicone Dressing Occlusion Versus Intra-Lesional Triamcinolone for Treatment of Keloid". Clinical Drug Investigation. 37 (3): 295–301. doi:10.1007/s40261-016-0484-x. PMID 27888448. ^ Farris PK. Topical vitamin C: a useful agent for treating photoaging and other dermatologic conditions. Although many people claim that vitamin therapy does in fact help. Dermatol Surg 2005;31:814-818. ^ Mee, Donna; Wong, Brian (1 October 2012). "Medical Makeup for Concealing Facial Scars" (PDF). Facial Plastic Surgery. 28 (5): 536–540. doi:10.1055/s-0032-1325647. PMID 23027221. ^ Shin, Thuzar M.; Bordeaux, Jeremy S. (2012). "The Role of Massage in Scar Management: A Literature Review". Dermatologic Surgery. 38 (3): 414–423. doi:10.1111/j.1524-4725.2011.02201.x. ISSN 1076-0512. PMID 22093081. ^ Cohen, BE; Elbuluk, N (February 2016). "Microneedling in skin of color: A review of uses and efficacy". Journal of the American Academy of Dermatology. 74 (2): 348–55. doi:10.1016/j.jaad.2015.09.024. PMID 26549251. ^ Ferguson, Mark WJ; Duncan, Jonathan; Bond, Jeremy; Bush, James; Durani, Piyush; So, Karen; Taylor, Lisa; Chantrey, Jonquille; Mason, Tracey; James, Gaynor; Laverty, Hugh; Occleston, Nick L.; Sattar, Abdul; Ludlow, Anna; O'Kane, Sharon (2009). "Prophylactic administration of avotermin for improvement of skin scarring: Three double-blind, placebo-controlled, phase I/II studies". The Lancet. 373 (9671): 1264–1274. doi:10.1016/S0140-6736(09)60322-6. PMID 19362676. ^ Tredget, Edward E.; Ding, Jie (2009). "Wound healing: From embryos to adults and back again". The Lancet. 373 (9671): 1226–1228. doi:10.1016/S0140-6736(09)60705-4. PMID 19362658. ^ "Liver damage 'could be reversed'". BBC News. 27 December 2007. Retrieved 1 January 2008. ^ "Gel 'to speed up wound healing'". BBC News. 22 January 2008. Retrieved 23 May 2010. This page was last edited on 9 March 2019, at 14:46 (UTC).